Flash-Integro announces its new free product – VSDC Free Screen Recorder. This easy-to-use screen video capturing application also has professional features that can compete with pro tools head-to-head. Many users need to record what’s being shown on their screen or on some part of it. Sharing experience, interacting with the technical support personnel, or just capturing screenshots for reference are typical home-use applications of video screen capture software programs. 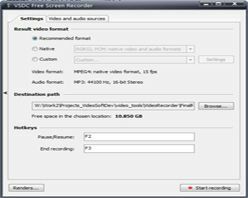 VSDC Free Screen Recorder, however, offers users a more powerful instrument than one would expect from freeware. VSDC Free Screen Recorder is a new product by Flash-Integro LLC that has all of the features of the other products made by the company: it is free and easy to use but also powerful. Whether recording the entire screen or just one window that is shown on the screen – the program is a reliable helper. Its support of dozens of video formats enables user to quickly prepare a final video for a specific purpose. Interestingly, the tool operates with the codecs that are already installed on the system when it records audio and video. This means that minimum preliminary set-up is required, and the quality of the output video is always good. Among the pro features that are offered by the program are editable comments and notes that a user can set up to appear near the mouse cursor or called up with a hot key. In addition, a special pen mode allows users to literally draw on the screen while the capture is in progress in order to highlight or underscore important elements in the footage. 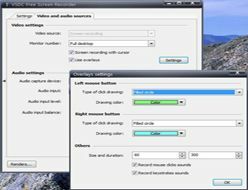 The VSDC Free Screen Recorder doesn’t try to offer everything; it remains focused on its main function yet also provides many additional options for easily creating video guides, tutorials, and how-to videos.